Frédéric Chopin, Ballades ; Impromptus ; Sonatas [Music Score]. The great composer and pianist was born Fryderyk Chopin near Warsaw, Poland. His father Nicolas Chopin was a French émigré teacher. The whole family was musical and artistic and Fryderyk began composing as a very small child. He began serious piano instruction at age seven and was invited to play in public the following year. Recognized as a child prodigy, he attended the Warsaw Conservatory and later studied in Vienna. In 1830, at the time of the failed Polish revolt against Russian rule, he went to Paris, where he adopted the French version of his name and lived for the rest of his life. In Paris, he flourished at the center of a circle of composers, artists, and writers of the Romantic movement, including Franz Liszt, Hector Berlioz, Felix Mendelssohn, and Eugene Delacroix. His original, expressive piano style and brilliant compositions won him widespread acclaim. In 1838, he began his love affair with George Sand (Aurore Dudevant), which lasted for nine years; he composed many of his works at her country house in Nohant. Chopin was dogged by ill health for nearly his entire life. Although he managed a successful tour of Great Britain in 1848, he returned to Paris desperately ill and died at age 39. 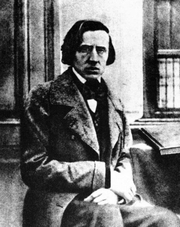 Frédéric Chopin is currently considered a "single author." If one or more works are by a distinct, homonymous authors, go ahead and split the author. Frédéric Chopin is composed of 40 names. You can examine and separate out names.